Guide to Greece and to the Greek Islands with travel information about: history, mythology, museums, places and destinations to visit, photos and videos, best hotels, weather forecast, latest news, comments and all archaeological sites. Let the Greece you’ve been imagining ﬁll your senses. Everything you might want to know about Greece. Corfu is the most beautiful of the Ionian Islands (the "Eptanissa"). It is located in the north of the Ionian Sea, across from Italy and 3 km from the Albanian coast on the east. Unlike the islands of the Cyclades (Mykonos, Santorini, Crete etc.) the scenery is not composed of white cubic houses on barren stretches of rock. The island of Corfu is one of the greenest islands of the Mediterranean. The vegetation is lush, evergreen, century-old olive groves cover the greatest part of the island and the quantity and variation of wild flowers is astonishing! Corfu is endowed with a landscape of rustic scenery and woodlands, rich plains, hills, flourishing olive groves, imposing mountains, valleys, lakes, charming harbors and bays, long coasts with broad beaches, and traditional villages, which provide spectacular vistas and quite a variety of destinations for the tourist. Corfu is mainly known for the lovely beaches. Therefore many people have a notion that the place is not very apt for children. However, it is a not the only thing to know. If you are bringing children for holidays, they are sure to enjoy to the fullest and will remember the experience of the visit for lifetime. Corfu has many options for children and you will be surprised to see that children enjoy more than adults on the island. The only thing required for that is proper planning of the entire travel. Take some time and involve the kids in planning the holidays to the Greek island and see how excited they become. At the heart of Corfu's history and home to a UNESCO World Heritage site is Corfu Town. Despite severe damage in the Second World War, the town still has two huge and impressive forts as well as the 16th Century church of Agios Spiridon, other delightful French and Venetian architectural splendors as well as art galleries and museums. 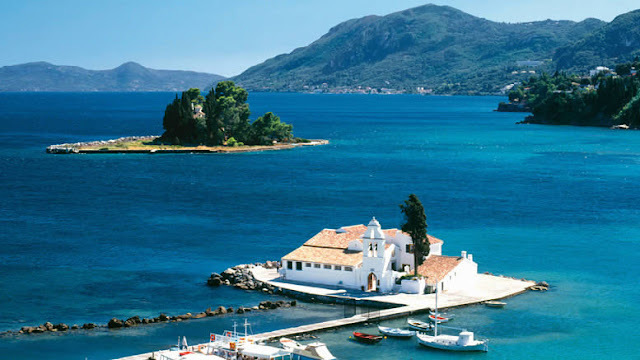 Around the island there are the ancient monasteries and Paleokastritsa that are well worth visiting, as much for the magical Corfu scenery as the locations themselves. Корфу представляет собой достаточно большой удивительной красоты остров, вот уже тысячи лет являющийся природным связующим звеном между чувственным Востоком и рационалистическим Западом. Он расположен на северо-западной границе Греции и омывается темно-голубыми водами несравненного Ионического моря. К востоку – возвышаются горные массивы находящейся напротив. Албании. Название острова на большинстве европейских языков является искаженной формой его средневекового названия «Корифо. Корфу был родиной многих известных и значимых политических деятелей и, главным образом, интеллигенции Греции. Значительным преимуществом Корфу является культура – как современности, так и прошедших лет. Приехав на Корфу, повсюду возникает ощущение, что Вы находитесь на стыке дней сегодняшних и вчерашних. Это происходит потому, что, помимо культурного наследия прошлых времен, гармонично влившегося в ежедневный быт острова, сегодняшние его жители – удачное сочетание многих культур как Востока, так и Запада – ведут своеобразный образ жизни, который как будто рожден. Wow! Its great pics about Greece.Its great destination of going abroad to visit with family, friends.Its awesome place for fun.Thanks to shows pics of greece and videos too.